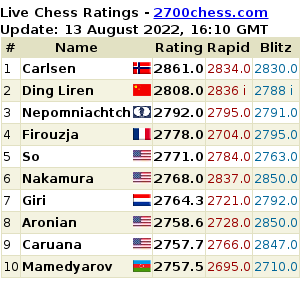 Two young chess prodigies are joining the 16th BCC Open – 22 year-old Dutch grandmaster Benjamin Bok has a live rating of over 2600 after winning this year’s London Classic Open with a 2771 rating performance, and Russian GM Ildar Khairullin, who has a live rating of 2652. This 25 year-old super-GM beat Shakhriyar Mamedyarov at the Aeroflot Open (2760 rating performance), and is two-time junior world champion, as a winner of U-14 (2004) and U-18 (2005) categories. There are now 86 players registered, including 18 grandmasters, and representing 30 different countries.